ChildSafe is a child protection network that involves all members of the global community in how to take responsibility and actively protect children. Its programs range from training community members in South East Asia to identify and protect children from risks and abuse, up to international travelers, making them aware of responsible travel and how they can best ensure that children do not come to harm through their actions. Within the Asia region ChildSafe hotline numbers are promoted to provide an immediate action response for members of society, travelers or children themselves that need help or advice on what to do when a child is in, or at risk of being in, an abusive or threatening situation. ChildSafe Traveler 7 Tips encourage international travelers to think about how their behaviors can impact children. The program provides advice to travelers on traveling responsibly and doing their part in protecting children wherever they travel. Together, we can all help to create supportive environments where children are protected. The protection of vulnerable children around the world remains an urgent issue for all countries to address; the work of Friends-International is pertinent to this – The ChildSafe Network project aims to continue to create safe communities for children through providing services to vulnerable children and youth (in particular street living and working children) while developing a community wide child protection network (the ChildSafe Network) which encourages the community to protect children from harm. Tourism has many positive impacts on developing countries, but travelers often unwillingly and unknowingly increase the vulnerability of children. ChildSafe 7 Traveler Tips provide messages to travelers on how to behave responsibility and in a manner that is conducive to developing a positive future for the society they are visiting. The network expands within the tourism channel to educate hotel and tour agencies on child protection issues specific to their employment and actions they can take to prevent child exploitation and prevent any harm. The support of businesses and organizations is essential to the success of the ChildSafe 7 Traveler Tips. This ensures that the message reaches out to as many travelers as possible and that a positive behavior change takes place towards marginalized children. Friends-International estimate to date the campaign has reached over 3 million travelers in nine countries. ChildSafe Network was developed and is powered by Friends-International, an organization founded in 1994 in Phnom Penh, Cambodia. 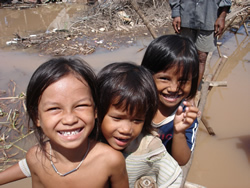 Today, Friends International is working to protect and improve the lives of marginalized children and their families with direct programs in Cambodia, Lao, Thailand, Indonesia and with like-minded partners across South East Asia, Central America, Egypt and the Philippines. A key objective of Friends-Internationals is to reintegrate marginalized youth into education, training, family and society. We work to get children back into public school with their peers and to provide vocational training to young people for future employment and to ensure a life away from the streets. We also work with families to provide income generation projects, so parents can support their children and keep them in school. ChildSafe is a child protection network that involves all members of the global community how to take responsibility and actively protect children. The programs range from training community members in South East Asia to identify and protect children from risks and abuse, up to international travelers, making them aware of responsible travel and how they can best ensure that children do not come to harm through their actions. Within the Asia region ChildSafe hotline numbers are promoted to provide an immediate action response for members of society, travelers or children themselves that need help or advice on what to do when a child is in a threatening situation.